A small child awakes to find blackened leaves falling from her bedroom ceiling, threatening to quietly overwhelm her. ‘Sometimes you wake up with nothing to look forward to …’ As she wanders around a world that is complex, puzzling and alienating, she is overtaken by a myriad of feelings. Just as it seems all hope is lost, the girl returns to her bedroom to find that a tiny red seedling has grown to fill the room with warm light. 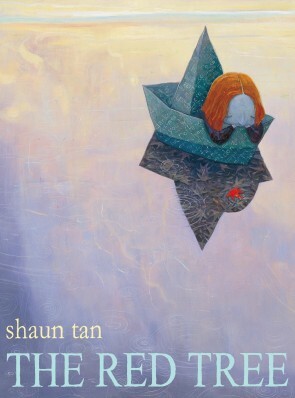 Shaun Tan’s latest creation, The Red Tree, is a book about feelings – feelings that can not always be simply expressed in words. It is a series of imaginary landscapes conjured up by the wizardry of Shaun Tan’s masterful and miraculous art. As a kind of fable, The Red Tree seeks to remind us that, though some bad feelings are inevitable, they are always tempered by hope. Shaun Tan was born in 1974 and grew up in the northern suburbs of Perth, Western Australia. In school he became known as the ‘good drawer’ which partly compensated for always being the shortest kid in every class. He graduated from the University of WA in 1995 with joint honours in Fine Arts and English Literature, and currently works full-time as a freelance artist and author in Melbourne. Shaun began drawing and painting images for science fiction and horror stories in small-press magazines as a teenager, and has since become best known for illustrated books that deal with social, political and historical subjects through surreal, dream-like imagery. Books such as The Rabbits, The Red Tree, The Lost Thing and the acclaimed wordless novel The Arrival have been widely translated throughout Europe, Asia and South America, and enjoyed by readers of all ages. Shaun has also worked as a theatre designer, and worked as a concept artist for the films Horton Hears a Who and Pixar’s WALL–E. He is currently directing a short film with Passion Pictures Australia; his latest book is Rules of Summer (October 2013). Shaun is the winner of the 2011 Astrid Lindgren prize, the world’s richest children’s literature award. The award described Shaun as ‘a masterly visually storyteller’. The film adaptation of The Lost Thing won the Oscar for best animated short film in 2011.